THREE aspiring Zanu PF legislators have been forced to defend themselves after their questionable past was exposed ahead of tomorrow’s ruling party primary elections. 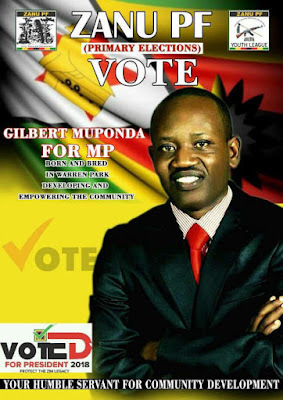 Mazowe North candidate, Campion Mugweni is crying foul and accusing his opponents of mudslinging, following revelations that he was once convicted of tax evasion in the United States. Mugweni yesterday admitted that he indeed served time in a US correctional facility but was now a reformed man. “This happened 12 years ago and I have since served my time and returned home eight years ago. It is unfortunate that this past is now being used to smear campaign me now when in 2016 I stood for the same post, but lost to the incumbent — (Martin Dinha),” Mugweni said. Mugweni said on both occasions, State security agents cleared him to contest the polls. “I have been cleared by all security agents because these issues are circumstantial. I have a police clearance,” he said before producing the same. Mugweni was reportedly sentenced to 66 months in jail for tax-related fraud in the US and ordered to pay $1,9 million in restitution in 2008. He was reportedly deported to Zimbabwe after serving his five and half years in prison. This means he could have been deported in or around 2013. “I will never run away from my unfortunate past, but I have also contributed immensely to the well-being of the people of Mazowe something which speaks for itself,” he said. Founding ENG Capital Group director, Gilbert Muponda said he could not be classified as a criminal because he was never convicted of any crime by the courts. Muponda and co-director Nyasha Watyoka were arrested in 2003 after ENG Capital collapsed and failed to pay hundreds of creditors. But the businessman said he was cleared by authorities including the High Court, Interpol, ZRP and the Reserve Bank of Zimbabwe. “I was wrongfully accused more than a decade ago. Only the Court can declare criminals not (Temba) Mliswa or the Financial Gazette,” he said on his Facebook page. “A lady who fled the scene of the accident where my sister died and then dodged every opportunity to answer questions refusing to tell us what transpired wants to be an MP?” tweeted Mutinhiri. Mutinhiri said Francis had failed to inform her family what really transpired when her sister, Belinda died in a car crash in 2016 as the two were in the same vehicle.